Welcome to the first edition of the latest and sometimes greatest round up of political gossip and rumors of the 2019 Alaska legislative session. We’re just on day four of the session and, hoo boy, what a week it’s been. “It’s hard to top what’s already happened this week in front of God and country,” one source said in response to our weekly rumor grubbing. “Just” 86 days to go. That’s more or less the thinking we’ve heard from multiple sources on when to expect a majority to finally form in the House. Without citing a whole lot of even soft evidence, people are optimistic that House legislators will somehow find a deal in the face of what sure seems like a lot of sides that are unwilling to budge. There’s been little talk circulating of just what form that majority will take: Will someone cave and sign on with the Republican majority? Will there be a bipartisan coalition? Either people are playing their cards very close to their chest or there’s just not that much information to really go around. It’s probably a little bit of both. There has been a lot of attention paid to which legislators are going into which offices, but this appears to be one of the costs of covering the session from the safety of Anchorage as we’ve been unable to get our sources to blab. Which, I guess, is reasonable when things are sensitive, and people just want to get to work. With the official swearing-in of Rep. Sharon Jackson on Thursday (oh, boy, you bet we got more on that below), the party-line House Republican “Majority” is at 20 with pretty much no clear path to the 21 needed to put the gavel into the hands of Rep. Dave Talerico. The path is similarly unclear for the 19 representatives that would be included in the remnants of the Alaska House Majority Coalition or the bipartisan-pushing Rep. Gary Knopp, R-Kenai. What we have heard is some blunting of the generally bad reputation (at least in the eyes of progressives) of North Pole Republican Rep. Tammie Wilson, the Republicans’ chosen co-chair of the House Finance Committee. Wilson has been, well, inflammatory in years past with wild cuts and wilder claims, but as one source points out that’s kind of the job of the minority (and if we’re being honest even when she was part of the Republican majority, making wild cuts there too, she was essentially a marginal member). Those who had to sit through her Finance subcommittee meetings, however, probably have a different perspective on it (though a lot of those proposed cuts were reversed before they got anywhere close to reality). Being in the driver’s seat is a completely different story, the source argues, and noted that Wilson has been one of the more reasonable Republican legislators in the face of the $1.6 billion of cuts the Dunleavy administration is planning to hand down, essentially arguing that it’s unrealistic and potentially damaging. She’s stepped up. Could Wilson be a surprise foundational piece of a Knopp-assembled bipartisan coalition? Who knows, but at this point, nothing seems like it’d be outside the realm of possibility. It could explain why we’ve heard mention there might be a “heading to the gallows” kind of mood among the more progressive Democrats. Knopp’s plan for a truly bipartisan coalition didn’t have room for every Republican or every Democrat after all. Speaking of Rep. Gary “Doing Something After Being Named The Midnight Sun’s Most ‘Who’ Legislator of 2018” Knopp, it sure seems like he was right to worry about relying on Rep. David “A Step Away From Convening the People’s Legislature in the Back of a Denny’s” Eastman as the 21st vote in the Republican majority. “If Gary was wavering at all—and I don’t think he was—but to the extent that he might have been, this whole thing would have definitely unwavered him,” a source said of Eastman’s stunt to seat now-seated Rep. Sharon Jackson. As you could probably tell by the responses, no one—including Republican leadership or, really, even staff—were clued into Eastman’s creative reading of the law that would somehow allow a deputy clerk (or a postmaster, for that matter) to make someone into a legislator. The move scuttled the Wednesday floor session (where most had expected Jackson to be sworn in). It’s also a smooth move for freshman Rep. Josh “Films Facebook Lives like a Dad” Revak to have gotten involved in the whole ordeal. We’ve heard he’s since become media shy. The Facebook Live of the whole thing, including its smug assertion of an illegal reading of the law, has since been deleted. If you hoped that the election of Rep. Neal Foster as the temporary speaker for the House would mean a break in the impasse (or, you know, the clearance for maintenance to hang literally anything on the walls), then think again. The House cancelled its Friday floor session, scheduling a technical session on Saturday to meet its requirement of meeting every three days. Better play it safe, in case Eastman shows up with his own cadre of sworn-in House members to pull a 1981-style coup. $1.6 billion of unallocated cuts?!? Gov. Michael J. Dunleavy and company have promised to match expenditures to revenues with their budget this year, meaning that legislators are bracing for some $1.6 billion in cuts in the budget expected by Feb. 15. Just what he decides to cut, especially when his agenda beyond “SB 91 bad, PFDs (mostly) good,” will be interesting. Dunleavy’s certainly brought on the team to do so (more on that below), but Sen. Donny Olsen, D-Golovin, raised the specter of everyone’s favorite gutless budgeting tactic: unallocated cuts. But one source suggested that won’t be the case. According to the source, OMB Director Donna Arduin and the administration isn’t keen on leaving the decisions up to the Legislature (which, hmm, seems to be a pretty astute observation of the Alaska legislative process for someone who’s only just been in Alaska for a few months) and they are, in fact, going to suggest some pretty massive cuts are on the way. Just what they are is uncertain for sure as a lot of ideas along the lines of consolidation of departments. It’d probably mean favorite targets like the Department of Commerce, Community and Economic Development, the Department of Labor and the Department of Health and Social Services will probably be getting plenty of unwanted attention. Still, even as the Dunleavy administration is readying its budget, legislators aren’t letting all his many hires and new positions go unnoticed. Expect there to be some scrutiny once things get rolling. His multi-year PFD payout plan isn’t getting particularly high marks, either. Another interesting development to come across our radar is a reworking of how bill analyses are done by the administration. In the past, when legislators would ask the administration to respond to legislation or how a bill would work that would go directly to program staff, who’re the subject matter experts on how things would work. The interesting development under the Dunleavy administration is that these forms apparently have added two additional requirements: Approval from the commissioner and asking if the bill aligns with the governor’s priorities. The tipster said it’s going to be particularly tough to judge bills related to, well, just about anything beyond “SB91 bad, PFD good” is going be difficult to judge. The question is, however, how would Sen. Bill Wielechowski’s “let’s pay the back PFDs all at once” rank against the governor’s drawn-out proposal? It sounds like Gov. Michael J. Dunleavy’s decision to cut bloggers out of the process has extended to the Legislature, but not after some hemming and hawing. While your humble editor is hanging out in Anchorage, Alaska Landmine’s Jeff Landfield and You Know Who did head down to Juneau and applied for Legislature’s media credentials (which are really just passes to get on the floor). We heard that they were printed up, but ultimately not handed over by Senate Rules Committee chair Sen. John “No ‘Smart Devices’ on the Floor” Coghill. It sounded like Coghill was on board to hand them over, but some other members of the Republican Senate Majority were not particularly keen on seeing Landfield on the floor (though that didn’t stop him from appearing in the gallery). “She’s not my daughter, she’s not my niece, she’s actually just my sister—and we’re not married—I know there’s some confusion about that,” he said. 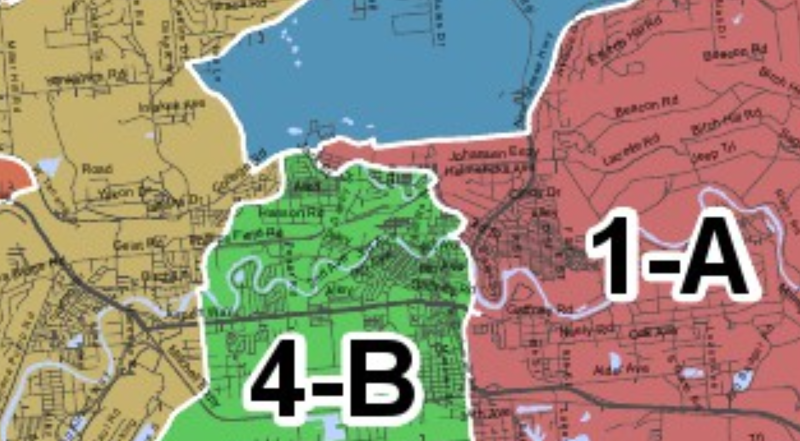 The backstory here is, of course, the last round of redistricting in which Jim Holm, the Republican who Kawasaki booted from office in 2006, drew an interesting protuberance out of Republican Rep. Steve Thompson’s district into the west Fairbanks district held by Kawasaki. It didn’t pair the incumbents together but it did, however, have the result of putting the home owned by Sonja Kawasaki into Thompson’s district. The protuberance, which required crossing the unpopulated-by-voters Creamer’s Field Migratory Waterfowl Refuge to grab about six blocks of Kawasaki’s district, was ruled unconstitutional. Also, sure, why not split the city of Fairbanks into two different Senate districts while you’re at it. This week, the Juneau Assembly swore in Alicia Hughes-Skandijs on Monday night to replace the seat vacated by Sen. Jesse Kiehl. It brings the female membership of the nine-member body to an impressive six, which has got to be a first. Rep. Harriet Drummond’s phone is a reported casualty. Sen. Bert Stedman is back in the saddle of the Senate Finance Committee and he’s going to be running a tight ship. On the first day of meeting, he made clear that he’s going to keep questions moving along quickly and that there will be absolutely no eating at the table. In senate finance, you may not eat. You may not blather, and you may not tweet. The public will watch with a respectful air. It is the mighty Stedman. On a more serious note, Stedman’s comments about cutting off questions that he deems to be “delay tactics” is another step in the committee’s bad habit of taking the answers to a lot of its questions later (you know, out of sight of the public). We’ll keep an eye on this one. I ordered one days ago, and they keep telling me I’ll get it soon. Be the first to comment on "Friday in the Sun (Jan. 18): The ‘Maybe a week, but then again…’ edition"